During our screen print process, high-quality ink is pressed through a fine mesh screen directly onto each bag, reproducing artwork with impressive clarity. Available on non-woven polypropylene, 210 Polyester, 600D Polyester, and Ripstop Polyester. Our HD Screen Print services are available at an additional charge. Our HD Screen Print is perfect for logos that have fine lines or small text and this site. *Disclaimer* The information provides general guidelines, please submit artwork to sales@acuraline.net to confirm your artwork. 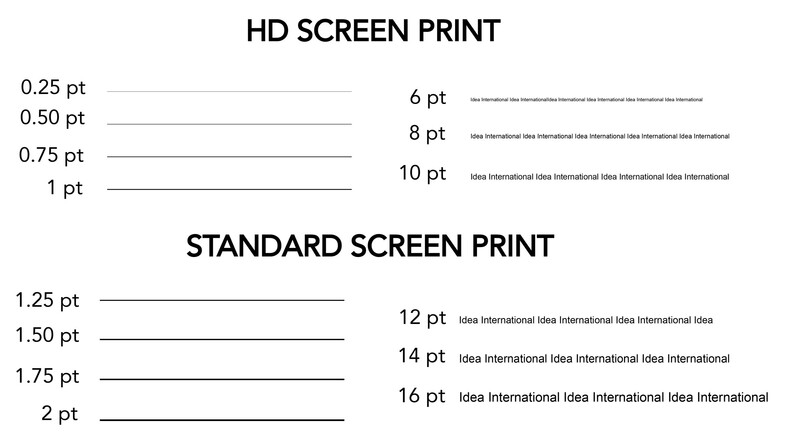 Some fonts at 12&14 point may require the HD process. Please make sure to converting your fonts to outlines. This ensures that your artwork will print exactly how you expect it to look. For best results, artwork containing halftones must be pre-approved and is available on select items only. Color percentages for art containing halftones should range from 20% to 60%. Areas less than 20% may not print and areas greater than 60% may fill-in and become a solid color. Designs that contain gradients or blends may need alterations for optimum print quality and will require a final, signed proof approval.